CONTRIBUTE content or images. 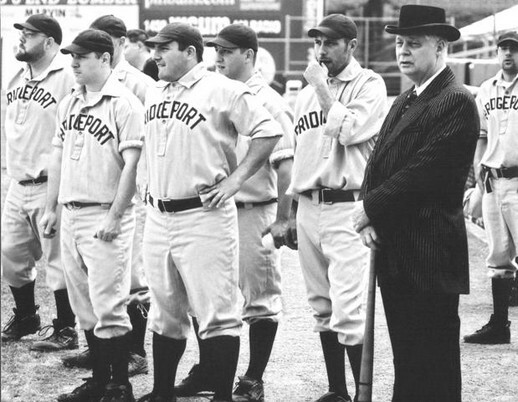 If you have new information about Bridgeport baseball history, or an image to share, please email to Mike@MikeRoer.com. Please include the source (name of publication, date and page number) and who to acknowledge for the new information or photo. [LEFT] The author has served as an umpire for the vintage baseball club, the Orators. Besides researching and writing the baseball history, Roer founded the Bluefish Boosters. [TOP] Original pin. Also to generate support for the Bluefish, Roer created and installed three exhibits on baseball, one for the Silver Lining Gallery, and two at the Barnum Museum.